From Auburn to Willy's-Knight and everything in between. Over 100 car and truck makes are available. Vintages range from 1900-1985. Some models are out of stock from time to time due to their popularity. However, I'm always adding to my inventory. If I don't have it now, I will before too long. Many foriegn makes are available as well. Alcoholic Beverages- Liquor and Beer co.'s dominate in this catagory, with only a marginal Wine entry. 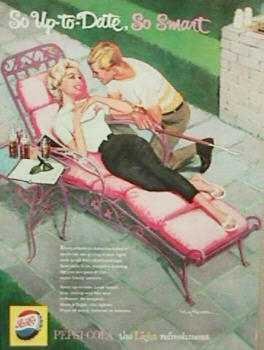 However, some Champagne ads from the 30's are quite striking. 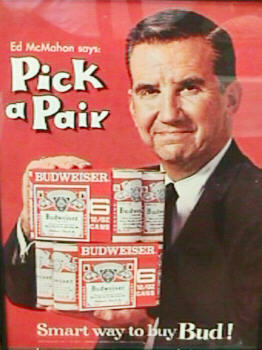 Budweiser, Schlitz, Miller, and Pabst are the leaders in the beer group. I also have some Blatz, Stroh's, and Coor's available. The liquor group is full of almost every type of spirit made by many of the world's top producers. 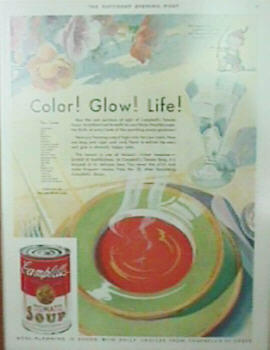 Currently my oldest Campbell Soup ads are in the late teen's, with some possibly going back as far as 1910. As many as three kids can appear at a time in some ads. 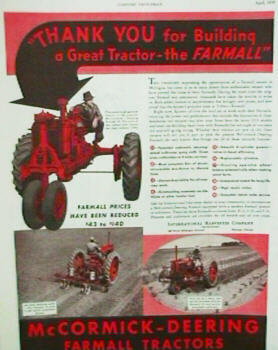 Color ads are rare prior to 1930, but even the B+W ones of that era, have some red in them. Trains- Pennsylvannia, New York Central, The Chessie System, B & O, Sante fe, along with many others, can be shipped today. 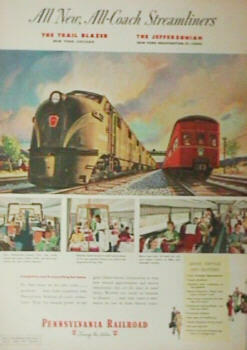 Also many wonderful articles about trains, and the men of the rails can be found as well. 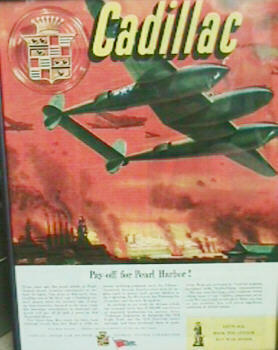 What a great way to augment your collection, with antique advertising. All of your favorite Hollywood stars can be found in this catagory. 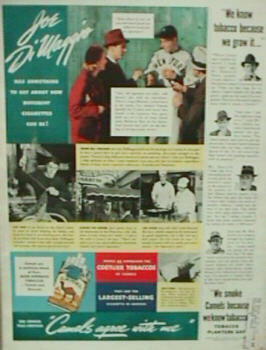 Almost every star from Bogart to Wayne, advertised everything from appliances to tobacco. I also have a full section Historical Articles on Hollywood as well. All types of foods are represented here. 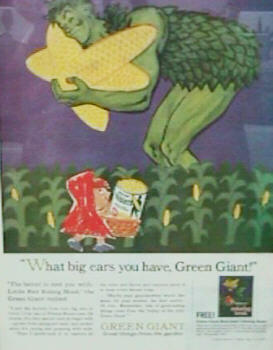 Jello, Kelloggs, Log Cabin, and Green Giant are some of the most colorful. Baking, Cereal, and Dairy are all in this group. Prop and jet aircraft, along with helicopter, dirgible's, and experimental prototypes can be found in this catagory. 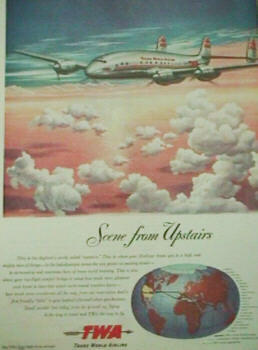 Boeing, Douglas, and Piper, along with many other producers are in stock. Small fishing boats to large Yachts can be found here. Chris Craft, Dodge, Gar Wood, and Elco Motor Boats are all available. 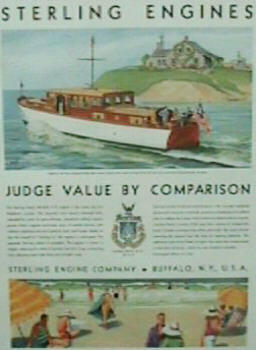 In addition many wonderful Sterling Engine Co. ads done by Donald Douglas. Buses- Mostly Greyhound Buslines with some Trailways, dominate this catagory. 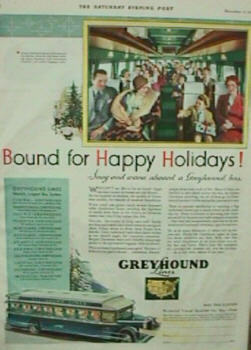 The earliest Greyhound in stock is shown here. Most are in the 40's and 50"s, and in color. Radio & speaker items start as early as the late teen's and run through the late 60's. Phonographs start a little later but run just as long. Tape machines and musical instruments are also available. RCA, Philco, Crosley, Motorola and Zenith along with many other brands are in stock. 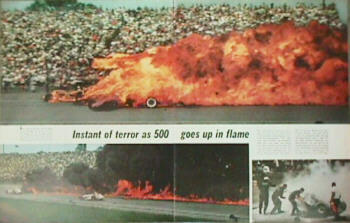 Racing- Indy, Stock, Land/Speed, and some Boat racing are all featured in this catagory. Tire, gas, and oil producers dominate the advertisers. Some car companies talk about distance and endurance racing. Few are in color, most being in black and white. Many however are two page ads, and quite spectacular. 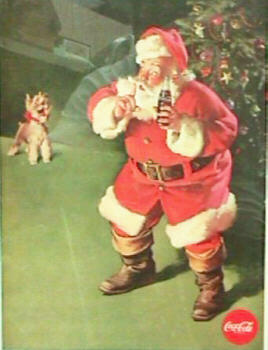 My current Pepsi ads run from the late 40's to the early 70's. Anything prior to WW II is extremely rare and priced accordingly. 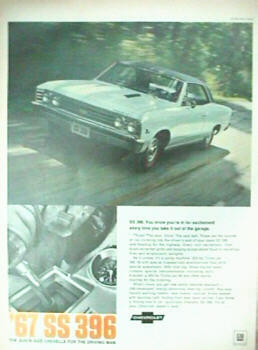 Most, if not all of the 60's ads are in color, with many being two pages. 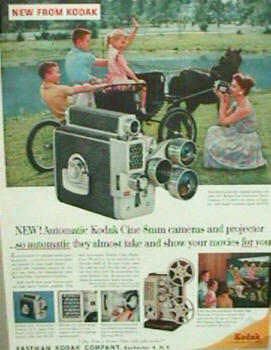 Beginning in the late teen's, Kodak was the king of picture taking. Ansco and Polaroid were a bit of late bloomers as far as advertising goes. 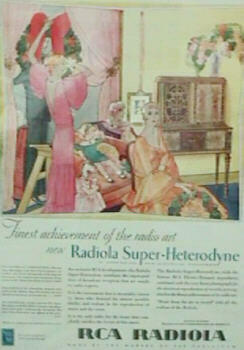 Many of the Kodak ads are in color and two pages. Farm Equipment - Tractor's mostly dominate this catagory. International, Oliver, Case, John Deere etc., are all here. As early as 1927 can be found, with many in the 40's & 50's. Baseball, Football, and Golf are the primary contributors to this catagory. I do have some Basketball and Hockey ads as well. Guns and Ammo items are also in this group. In addition, I feature many of these sports in the Historical Article section as well. 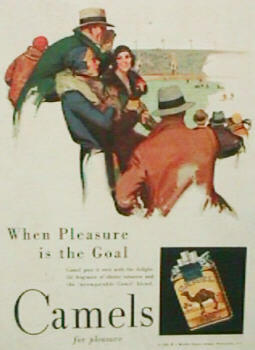 R.J. Reynolds, Philip Morris, The American Tobacco Co. etc., are in this catagory. 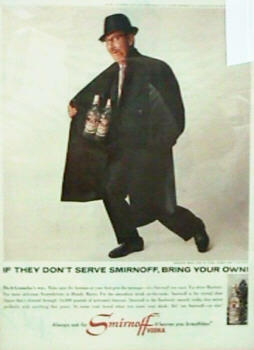 Virtually every ad makes some incredible claims about flavor and benefits. 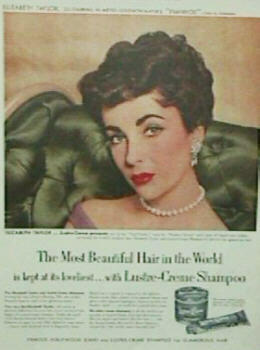 Many ads have either famous people or celebrities endorsing them. A full section on Cigars and Pipes and also cigarette lighters are available.